This Slow Cooker Meatloaf is the perfect easy and comforting low carb / paleo / keto-friendly meal. Cooks up tender, juicy and delicious with just a few minutes of prep. Now that the weather is getting chillier, my slow cooker has made a regular reappearance in our kitchen. I love how helpful they are. You just throw the food in and then several hours later – dinner is ready! It really doesn’t get much easier than a set-and-forget kind of dinner. 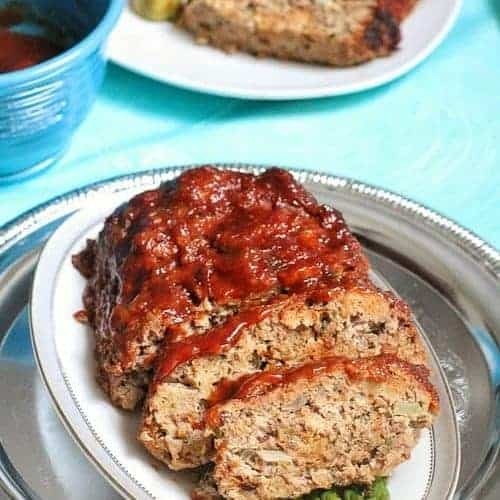 This low carb meatloaf recipe is perfect for a lazy Sunday’s when you just want to lounge around and not have to worry about slaving away for a great meal. I love when dinner cooks itself since it means more time to spend with loved ones. My husband is a big meat eater and has come a long way since I met him. He has now incorporated a lot more veggies and fruit into his diet. But if it were up to him, he would choose a hearty meaty meal everyday. Since this is his birthday week, he made a special request for meatloaf. I’ve made meatloaf for him many times in the past, but since yesterday felt like a lazy Sunday, I thought it would be a great opportunity to test a crockpot meatloaf. This crockpot meatloaf came out tender, juicy and full of flavor. Plus, it’s also low carb, paleo and keto-friendly. In a large mixing bowl, combine the eggs, ground beef, ground pork, tomato paste, mustard, sweetener, almond flour, thyme, marjoram, salt and pepper. Add the celery, parsley, onion and garlic. Using your hands knead the meat mixture to combine ingredients and shape into a loaf. Line slow cooker with a crockpot liner or 2 pieces of foil to make a sling for easier removal. Coat with non-stick spray. Place meat loaf into slow cooker and brush a quarter to half of the sauce over the top and sides of meat. Cover and cook on high for 40 minutes. Reduce heat to low and cover and cook for another 2-3 hours or until cooked through and no pink remains in the meat. Brush with more sauce and cook on high for another 10 minutes. Reserve the rest of sauce for serving. Let meat stand for 10 minutes before cutting. Serve with more sauce if desired. This was the easiest no fuss meatloaf I have made since I didn’t have to worry about it getting overcooked in the oven. I loved that I didn’t have to check on it for a few hours after throwing everything into the crock pot set on low. Let the meatloaf rest before cutting: when you first remove the meatloaf from the slow cooker, it can still be tender so you want to allow your meat to rest for at least 5 minutes before slicing. Use a serrated knife to cut your meatloaf – this ensures your slices are even and do not fall apart. Do not overmix the meat – you don’t want your meat to get too soft and end up falling apart. This Slow Cooker Meatloaf is the perfect easy and comforting low carb / keto-friendly meal. Cooks up tender, juicy and delicious with just a few minutes of prep. In a small bowl whisk together the sugar free ketchup, sweetener, Worcestershire sauce, vinegar, mustard and cayenne pepper until smooth. Set aside. In a large mixing bowl, combine the eggs, ground beef, ground turkey, tomato paste, mustard, sweetener, almond flour, thyme, marjoram, salt and pepper. Add the celery, parsley, onion and garlic. Every slow cooker setting cooks at various temperatures so feel free to adjust the cooking time according to your manufacturer's suggestions. Crockpot meatloaf sounds perfect for a lazy Sunday! It looks so succulent! Need to try this out in my crockpot soon! I haven’t made meatloaf is so so long – but my husband keeps asking me to make it for him! And I’ve definitely never done it in the crockpot! Such a good idea Kelly! I think I’ve only made meatloaf once long, long ago…and my husband and son are big meat eaters too. You’ve reminded me to make one again soon. I love that you can actually use the slow cooker! I’m all for making more use of that piece of equipment and it’s always such a great feeling to know a delicious meat is cooking away without having to tend to it. Your meatloaf came out great! Happy Thanksgiving, too! I love lazy Sundays and this meatloaf is perfect for when I’m lazy. I get those a lot! 🙂 I’m always looking for slow cooker recipes. This will definitely be on my to-make list. Looks mouthwatering Kelly! Now I really want to come over for dinner at your place! 😉 Have a great week sweetie! We love meatloaf but never have tried a slow cooker version, I think your recipe is about to change that – it looks great! Happy Thanksgiving, Kelly! I love meatloaf and am glad to know it can be made so successfully in the crockpot..it looks perfect! LOVE using the slow cooker. In fact, it’s going right now. Although, I wish I had this in there instead! Going to put this on my menu this week…we all love meat loaf. Especially the next day– in a sandwich! Pinned! What a delicious looking meatloaf! I love using my slow cooker. Your pictures look so pretty with the asparagus tucked underneath. I always assume that slow cooker is good for cooking stews and soup and didn’t know it can cook meat loaf too. I love the idea of making meatloaf in the crockpot – I’ve never tried that. I do sneak in lots of vegetables into my meatloaf – zucchini, mushrooms, red bell peppers – my kids love it and I love the fact that it has lots of veggies. Happy Thanksgiving, Kelly! I am totally drooling over this meatloaf… especially the glaze on top! And I love this idea of doing it in the slow cooker, everything always seems to come out so tender and moist when it’s been cooked that way. I will have to give it a try! Pinned! Now this looks like a meatloaf I can get on board with! Yum! Nice meeting you and yes I will let you know when the new site goes live. Thanks so much Juliana 🙂 Nice meeting you too and yes, please let me know when your new site goes live 🙂 Hope you have a fantastic week too! Wow! What a brilliant idea! I never would have thought to try making meatloaf in my crock pot. I can’t wait to try this! Thank you for sharing. Very glad I found your lovely blog tonight! Oooh, I love that this is made in the crockpot. And you are right – it probably comes out extra juicy and much better than meatloaves baked in the oven. No overdrying here! wow, the sauce is finger licking good…. preety good idea to cooked meatloaf on the crockpot! I love my slow cooker AND I love meatloaf, but I’ve never thought of combining the two. I will definitely be making this ASAP!! Thanks Amy, hope you do try it, the meatloaf comes out so moist and flavorful in the slow cooker 🙂 Have a great weekend! Do you you think if I made it and froze it for a freezer meal, that it would work? Hi Nikki, I have never tried freezing meatloaf but I’m sure you could try. I would probably freeze the extra sauce separately or make it the day that you plan to serve it. If you do plan on reheating it, I suggest putting it back in the crockpot on high for 30 minutes – 1 hour again with some more sauce to reheat it so it stays moist. Hey Kelly! I totally made this yesterday for dinner after church and it was delicious! I did alter the recipe based on what I had on hand. I used all lean ground beef and 2 Tbsp dehydrated onions instead of fresh onions and celery. I also used like 3/4 to 1 cup of Italian breadcrumbs instead of making my own and left out the marjoram (because I didn’t have any). I halved the sauce, used balsamic vinegar and no cayenne. We’ll be making it again! We loved this recipe thank you!